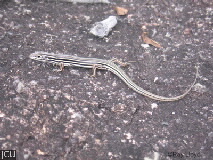 This skink has been found in a variety of habitats particularly where there are rocks or logs under which they can shelter. Contrasting stripes are prominent on the body , tail and legs, the basic colour is brown sometimes with an orange tinge, stripes are white, brown, or black with darker markings. The vertebral stripe is prominent. Lower surface with white and brown stripes.